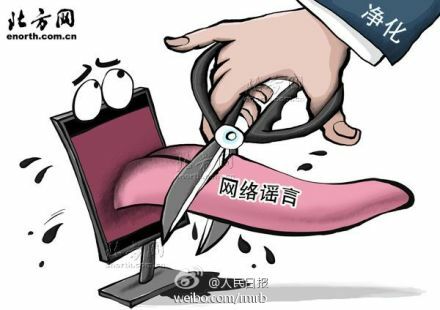 14 september 2013 | The current Chinese campaign against ‘malicious rumor-mongering’ on the internet seems on the surface to be just another round in the fight of the government against political dissenting voices. But there is another side to it as well. Rumors on the internet really do pose a problem in China. They harm reputations and cause hypes, just like they do in the West, but due to the lack of trustworthy alternatives (all media – most of all the state media – are distrusted), there is no reliable source for Chinese to turn to, no trusted newspaper that can help put a particular rumor into perspective. There is no shortage of fraud, false information and extortion efforts on Chinese social media. There are even companies that specialize in what Chinese call ‘black PR’: firms with millions of followers, that post thousands of rumors and false reports about competitors for clients. An easy way to make money, as Tech in Asia reports. The anti-rumor campaign is not just targeting influential bloggers, but also these black PR firms. Why is the government clamping down on social media? Garrie van Pinxteren, who was my guest at the Emerging China series at the University of Amsterdam this week, says that social media serve as a sort of safety valve in society: they help to decrease social tension and prevent social unrest. At the same time, they are used by the authorities to channel public opinion. This is done by the so-called 50-cent-party; many thousands of people who get paid 50 cents for any comment they publish according to instructions of the authorities. Social media are being closely monitored from the outside but also from within. Influential social media organisations such as Weibo, Chinese Twitter, employ hundreds of internal censors. With the help of technology, they scan millions of posts a day, and remove the ones that are deemed politically sensitive. Reuters recently wrote an excellent story about Weibo’s censors, after visiting it’s Tianjin censorship office, where rows of ‘Little Brothers’ cleanse online chatter. It is clear that Chinese leader Xi Jinping is closely studying his modern Chinese classics: both in the anti-corruption and the anti-rumor campaign he is clamping down on what he calls ‘tiger and flies’ (both on top officials and common people). That expression is reminiscent of old-fashioned Maoist campaigns. Mao launched his campaigns to eliminate political adversaries and to increase his grip on power. Tight control of the media was essential. Xi Jinping seems to be taking a leaf out of Mao’s book.